My Favorite Spice Organizer of All Time | Enuff with the Stuff – Sort Stow and Let It Go! Enuff with the Stuff - Sort Stow and Let It Go! As a professional organizer, I have helped many folks with their kitchen organizing and it seems universal that kitchens have gobs of spices. I see absolutely no correlation in the number of spice bottles to the passion, or lack thereof, for cooking either. It seems people like to have spices and many are ancient and rarely used beyond the one time they needed that oddball spice for a dish they wanted to try. I am a bit guilty of this one but what is the solution to a spice catastrophe in your cupboards? If you have tried stacking or using risers in your cupboard for spices then you know firsthand how this method is a set up for spices falling out of the cabinet every time you need to retrieve one. Not only that, due to the inefficiency of pulling out multiple bottles to locate the one you are trying to find it becomes a frustrating chore which results in a very unorganized collection of spices. There are many types of spice organizers on the market and depending on your volume you may find a variety helpful for you, but read to the end to find out my all time favorite! These self-adhesive clips are terrific if you have a small number of bottles, don’t use square bottles and have the room inside the cupboard to accommodate the bottles when the door is closed. This Spicy Shelf intrigues me but at the same time, I am not sure how realistic it is for most people to resist the urge to put things in that gaping space that has been cleared up by the spices being moved to the shelves. IF you are strong enough to resist this urge than I think this could work for you. I like that it can also be used to store a variety of items of varying sizes, therefore, making it a bit more versatile to be used in other spaces such as a medicine cabinet or crafting closet. But, my all time favorite is this lovely Spice Stack cube. It comes in two different sizes and can be stacked. I love that the larger version can hold up to 30 full-sized or 60 half-sized bottles, and of course any combo of that. It can accommodate even the square spice bottles but the knock-offs of this product can not(I learned that the hard way). But, if you only use round bottles feel free to buy the cheaper variety. My cheaper version did also break one of the little pegs that keep the drawer from falling out when you slide it out and swing it down. 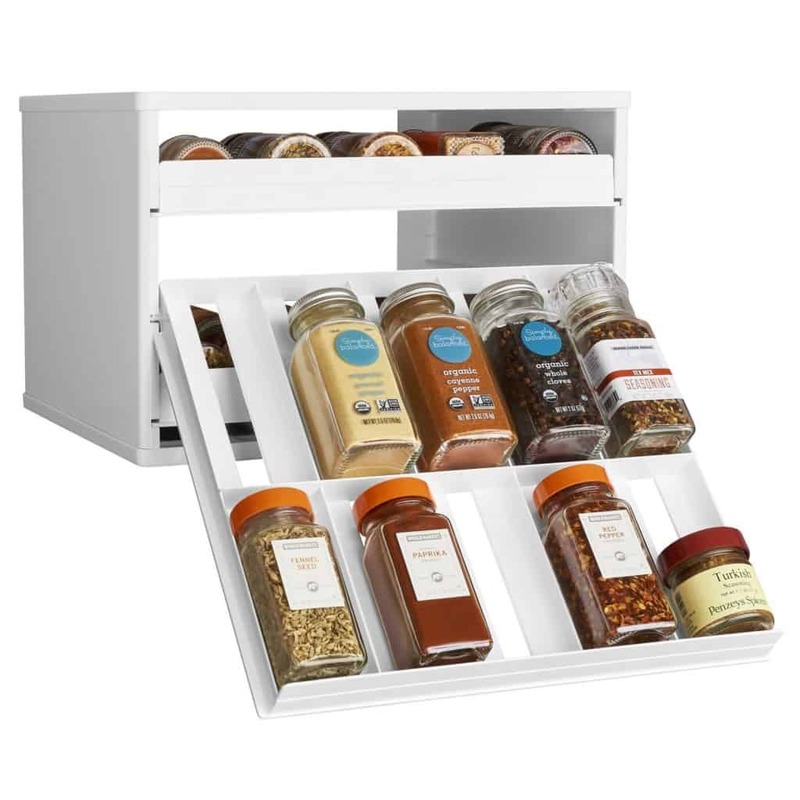 Overall, I love this particular spice storage because it is compact, holds a ton of spices, I don’t have to move other bottles out of the way to retrieve what I need and I can easily see exactly where each spice is. I have recommended this item so many times to clients over the years and they have all been thrilled with the unit. Check it for yourself! Now, before filling your new spice organizer, whichever version you choose, be sure to do a little purging. Toss the old spices, they really don’t last forever! Here is a great article to read about the best practices with spices and their shelf-life. I learned something new myself! Some of the blogs on this site occasionally contain affiliate links which help me earn a few extra buckaroos. I write about the things I love and have recommended or used myself throughout my years as a professional organizer. Maria White is a member of the National Association of Productivity & Organizing Professional(NAPO) and the local Washington DC chapter (NAPO-WDC). She has been professionally organizing since 2007 in the Northern Virginia area and received the Professional Organizer of the Year award in 2012. She works with overwhelmed moms and seniors preparing to downsize. She has three teenagers who have put her organizing strategies to the test over the years.